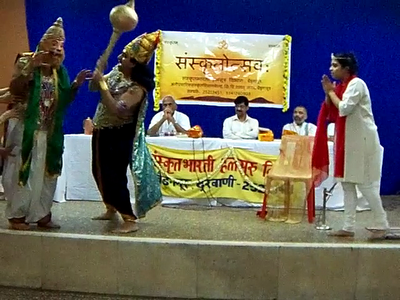 I post the "Sanskrit Day Celebration" pamphlet on this blog. In case, if you miss to attend it, then also "CHINTA MA ASTU" Don't worry. We had few songs, group songs, dramas, prize distribution and speeches by honorable guests. Everything in Sanskrit. Here is the video report. A still from daram "Dev: Kutra Asti?" Click here for some more photos. You will find some interesting articles in Sanskrit on this blog. Just stay tune to Express YourSelf !